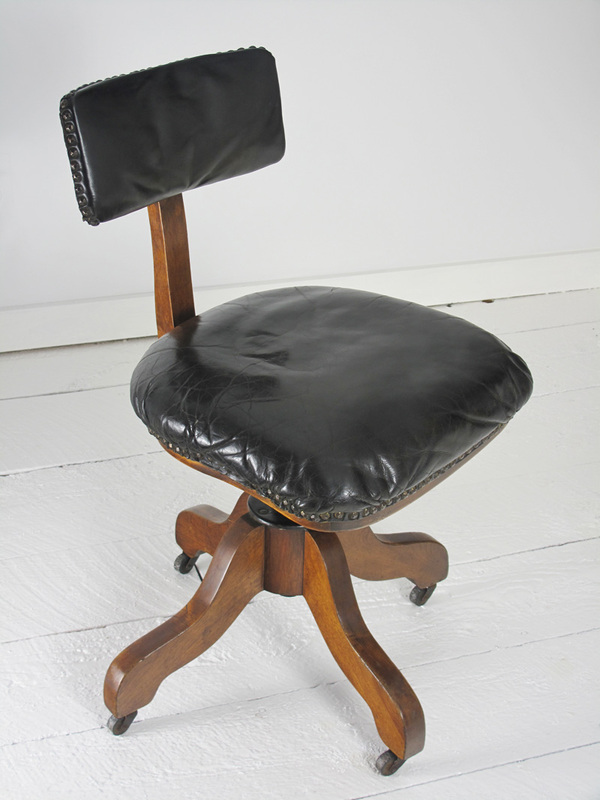 An exceptionally well made swiveling office chair by Sikes of Philadelphia. The company was known for quality and innovative designs. The wood is in fantastic condition, the mechanicals work very well and the ebony leather is in brilliant condition. The leather was recently conditioned/cleaned and is free of any tears or damage. The leather has a lovely worn patina, with some light cracking, which adds to it’s charm. The internal cushioning is in fantastic condition. It’s a very comfortable desk chair. The back support is adjustable and allows you to recline slightly, determined by how much pressure you use, while leaning back. The wood wheels are intact and roll nicely. The Sikes company information is available online, if you would like to know more about the history. The chair was made during a short period of time, while the Sikes company briefly located to Philadelphia, before returning their factory to New York State. The company was founded in 1859. The chair will ship by UPS and the shipping is very reasonable. Please be in contact for shipping charges to your location. International shipping is offered. Buyer is responsible for shipping & handling charges. All furnishings ship with a great deal of care, and are insured for the full sale price.